Beginning with the consideration of HB 482 (Thompson) in the House Homeland Security and Public Safety Committee on Wednesday, the Texas Legislature will spend quite a bit of time over the coming weeks considering the consequences of arrest and incarceration for Class C misdemeanors, which in Texas are minor offenses carrying a maximum punishment of a $500 fine and no jail time. There are two ways people end up incarcerated over Class C misdemeanors. First, after the US Supreme Court okayed the practice in Atwater v. Lago Vista (2001), police may arrest drivers for minor traffic offenses or violations of municipal ordinances, even if the maximum punishment is only a fine. That's what happened to Sandra Bland. Though she was eventually charged with resisting, when the officer first placed her under arrest, it was for the underlying charge of failure to signal a lane change. Alternatively, if drivers can't pay fines and fees and don't show up for court, a warrant or "capias pro fine" may be issued for their arrest. Millions of such arrest warrants are outstanding at any given time, and hundreds of thousands go to jail each year because they can't afford Class C fines. Proportion of jail admissions in Harris County in a four-month 2016 study for which a Class C misdemeanor was the highest charge: 11%. Percentage of Texans who, according to an Office of Court Administration poll, disapprove of jailing people over fines and fees when defendants cannot afford to pay: 66%. Percentage of Texans who believe "the wealthy enjoy substantially better outcomes in the criminal justice than poor and working-class people": 81%. Percentage of Americans the Federal Reserve says cannot pay a surprise $400 bill without selling something or going into debt: 40%. Percentage of Americans the Federal Reserve says cannot pay their current month's bills: 20%. * Source: Compiled from agency racial profiling reports from March 1, 2019. See more background here. ** Office of Court Administration Judicial Statistics data query. Governor Greg Abbott's endorsement of bail reform last year appeared to give the issue fresh life. But Abbott has now backed a bail-reform bill that eschews best practices and instead puts his office at the center of future decisions about pretrial reform. Federal court injunctions have mainly focused on representation of indigent defendants at bail hearings and eliminating discrimination based on ability to pay. Counties oppose requiring appointment of counsel for indigent defendants earlier in the process, considering this an "unfunded mandate." The Texas Judicial Council proposed using risk assessments to reduce incarceration of low-risk offenders (the Office of Court Administration developed an instrument based on work by the Laura and John Arnold Foundation to create a version counties could use for free). The bail industry opposes use of risk assessments with the heat of a thousand suns and is investing big money in lobbying and communications strategies to undermine bail reform efforts. After the death of a state trooper named Damon Allen, Governor Abbott weighed in to say his biggest priority was expanding the scope of preventive detention. The criminal defense bar adamantly opposes granting any additional preventive detention powers to the government. Criminal-justice reformers are split. In theory, all support reduced pretrial incarceration in county jails, but some oppose the use of risk-assessment algorithms which are viewed as racially biased. The Governor's proposal criticized by the Chronicle focuses primarily on preventive detention and expanding the power of his office over local court processes. The federal litigation driving the issue is more focused on access to counsel at bail hearings and reducing unjustified pretrial detention. Meanwhile, the Whitmire/Murr legislation ignores the access to counsel issue and promotes risk assessments and preventive detention, trying to merge the Governor's priorities with the judiciary's. Never say never, but it's hard to see the path toward threading that needle. And if it were to occur, the resulting bill likely wouldn't resolve the issues at stake in the federal litigation, and we'd be back doing this again in 2021. After the federal litigation has finished, it will be much more clear what needs to be in the bill to ensure counties meet baseline constitutional standards, since they will have been outlined by the 5th Circuit. In the end, the will may not yet exist to solve the problem through the political process. Certainly there is no consensus regarding what reform should look like and who should control it. But much could change between now and 2021. If the Lege fails to act this year, odds are federal litigation presently pending in the 5th Circuit will reach its denouement between now and the next time they meet. That will create a new baseline for pretrial-detention rules and give the Legislature much more guidance, and possibly different priorities. So look for the Texas Lege to revisit bail reform in 2021, whether or not a bill passes this time. 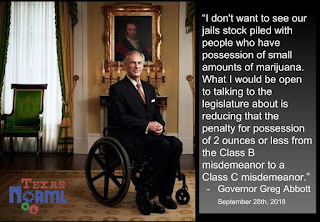 On Monday, the Texas House Criminal Jurisprudence Committee will hear a good little decarceration bill modifying the enhancement for misdemeanor three-strikes theft. This one should have been changed long ago. Under current Texas law, if at any time in your life you commit three incidents of misdemeanor theft, regardless of the value of the property, prosecutors can charge it as a state-jail felony. Even if the third "strike" is stealing candy from the grocery-store check-out line, prosecutors can seek a felony conviction and sentence. HB 1240 by Rep. Yvonne Davis would revise this statute in two important ways: First, it would require that the lower-level thefts be within five years of one another to count toward a penalty enhancement. Piecing together a new, theft with two others that are decades old will no longer be allowed. Second, the penalty increase stemming from a third "strike" would only bump the charge up by one category. So if the third strike were a Class A misdemeanor ($750 to $2,499.99), it would make no difference. But if it were a Class C or B misdemeanor, the penalty would still be a misdemeanor. This change will further reduce the number of inmates entering Texas state jails, which notoriously have the highest recidivism rates of any facilities in the system. Just Liberty reviewed Texas Department of Criminal Justice datasets and discovered that three-strikes theft accounted for almost 2,400 state-jail admissions in the 2018 fiscal year. This is the second most common reason for a state-jail sentence after possession of a controlled substance. A few of those folks would have still gone to state jail under HB 1240. But because most theft involves low-value items, many more people would have been charged with misdemeanors instead of felonies. Grits wouldn't be surprised if HB 1240 all but eliminated three-strike theft offenders in Texas state jails. Hard to argue with this one: Reduces incarceration in state jails where recidivism is high, reduces public perceptions of unfairness, but still sends a message that repeat theft won't be tolerated. Grits is delighted Rep. Davis proposed the bill and pleased that Chairwoman Nicole Collier is taking it up on the early side this session. HB 1240 deserves strong, bipartisan support from criminal-justice reformers. Legislation heard this week in the Texas House Criminal Jurisprudence Committee, HB 352 (Blanco) would require warrants for Texas law enforcement to use so-called “stingrays” or “cell-site simulators” to track people's cell phones, and provide more transparency surrounding use of these devices. So-called “Stingrays” or cell-site simulators are examples of relatively new surveillance techniques hovering at the bleeding edge of both cell-phone technology and Fourth Amendment jurisprudence. Because their use has been largely shrouded in secrecy and few clear precedents exist to model limits on this tech, the handful of law-enforcement agencies using it have until now operated in virtually a regulation-free zone. Rep. Cesar Blanco, a third-term Democrat and former Navy intelligence office, understands signals intelligence better than probably any other legislator and is an excellent bill sponsor for this topic. Cell-site simulators work by tricking your cell phone into believing it’s attaching to a legitimate cell-phone tower, which it “pings” periodically to make sure the phone is ready to make a call. This means that, when targeted users (or others in their vicinity) make a phone call, it’s routed through the cell-site simulator instead of the nearest tower. Representations by Houston PD at Monday’s hearing about the limited nature of the technology understated its capacity. Cell-site simulators hijack and divert cell-phone signals from their commercial carrier’s network, making it more similar to a wiretap than a “pen register.” Some models of cell-site simulators allow full-blown wiretapping; others provide access to metadata from calls and callers; others may only provide information on signal strength and direction, allowing investigators to triangulate location with just a few measurements. It all depends on how much functionality an agency chose to pay for; the device is capturing the entire signal and can let investigators access any or all of it. The US Department of Homeland Security established a policy of seeking a warrant for use of cell-site simulator technology with limited exceptions for exigent circumstances. At Monday’s hearing, police expressed fears that innocent people might be hurt if information from search warrant affidavits about how and when police used the technology ever surfaced. But search-warrant affidavits have been public records since the dawn of the Republic. The more significant concern is that law enforcement will use the technology unaccountably and secrecy will protect them. Not only does the public deserve to know when the government is using invasive surveillance technology, undue secrecy creates systemic problems. In Houston, police have even kept prosecutors in the dark when stingray tech was used. Texas legislators should extend the same warrant requirement mandated by the Supreme Court in US v. Carpenter to cell-site simulator devices. This shadowy practice has flourished for too long on the edges of modern technology and privacy law. HB 352 is Texas’ opportunity to begin to restrain and regulate it. See prior, related Grits coverage. Unlike the stingray legislation, no one opposed this bill. There was a half-hearted effort by a cop speaking "on" the legislation to preserve the real-time vs. historic location information distinction that the Texas Court of Criminal Appeals tried to stake out in Sims v. Texas. But it's awfully hard to defend the idea that the government has a right to know where you are at any given time, in real time, without demonstrating probable cause. From the solitude of Judge Barbara Hervey's chambers at the Court of Criminal Appeals, one perhaps can make that strained argument without fear of recrimination. At a legislative hearing, nobody even tried. The reality is, even if they tried to do a Less-Than Carpenter Codification, this area of constitutional law is fluid and trending toward requiring more warrants for surveillance, not less. As such, Grits imagines that trying to short-change the warrant requirement could result in future federal court decisions rendering the language anachronistic. Rep. Blanco's approach is the wiser one.